Photo 1. 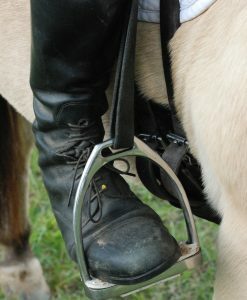 The rider’s foot is curled so that the weight is on the outside. The inside of the leg has shortened. Is your weight on the outside of your foot? 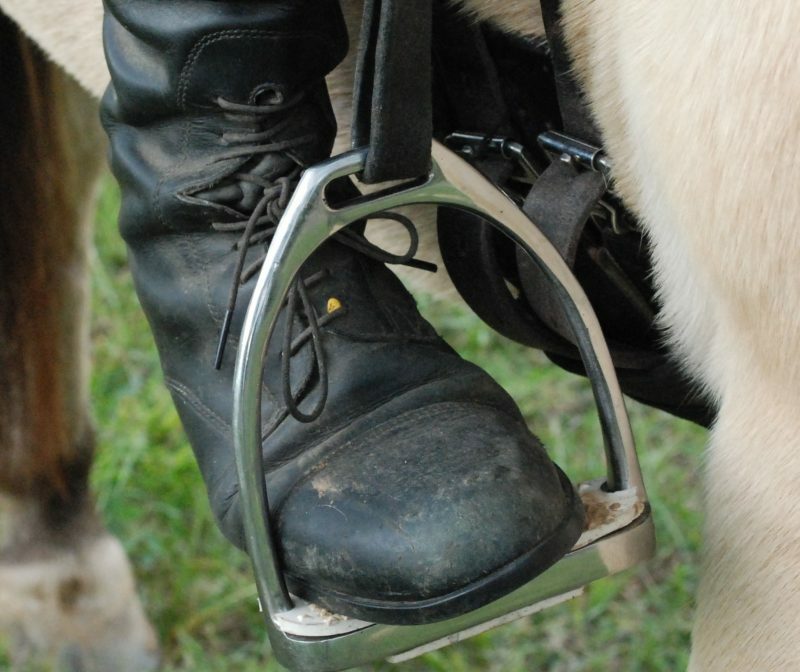 Do you curl your foot or cram your little toe against the outside branch of the stirrup?? Do you try to wrap your leg around the horse? Do you have ankle or knee pain as a result? Does it feel like you are never strong enough to hold the horse with your inside leg? Many riders have an unstable inside leg. Some leg positions can damage to your joints not to mention be ineffective in controlling the horse. Here’s a quick tip to help you stop contracting and start lengthening through the inside of your leg for stability and strength. 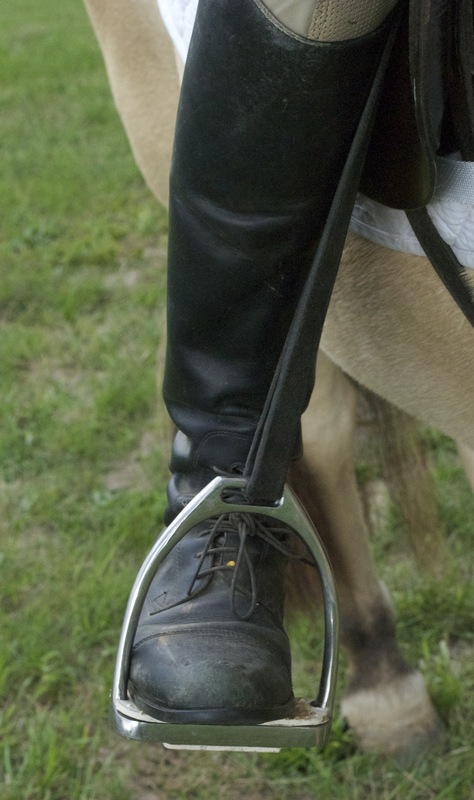 Next time you ride, notice what happens to your feet in the stirrups. Are they flat on the tread with the weight evenly distributed across the whole foot? Or do your ankles break over to the outside? Are your knees riding up over the flaps of the saddle? Does one ankle break to the outside or one foot brace more than the other? Photo 2. With her foot out of the stirrup the rider lengthens the inside of the leg from the pelvis to the foot. To feel the effect of this position stand with both feet curled inward. Notice how your knees turn out and your body drops down. It is difficult to stand erect. When you curl your feet to wrap your leg around your horse your knees turn out making it difficult for you to sit elegantly in the saddle. The muscles along the inside of your legs shorten pulling your legs up instead of lengthening down. In the sitting trot you will bounce and grip rather than go with the horse’s movement. Stand again with your feet shoulder width apart and your feet flat on the floor. Imagine the distance your pubic bone to the big toe side of your feet along the inside of your leg. Think of lengthening this distance slightly keeping your knees bent by pressing your feet against the floor. This is different than simply straightening the knees. It is as if you were growing longer. As you lengthen the inside of your legs feel how tall and erect you become. Notice that your pelvis can move forward underneath you. Under saddle you want to lengthen and invite your horse to move forward underneath you rather than trying to shove him through with your buttocks. Photo 3. Lengthening through the inside of the leg with her foot in the stirrup. The rider’s weight is evenly distributed across the stirrup. Her lower leg is off the horse because she has a long leg in relation to the size of the horse’s ribcage. To find the length through the inside of your leg in the saddle standing still, drop one stirrup. Slowly rotate your leg from the hip so that the foot is pointing forward, parallel to the horse. Gently lengthen along the inside of your leg as if you want to press the inside edge of your foot against an angled wall. Be very careful as you can easily create a cramp in your hip if you do this too strongly. Replace your foot in the stirrup and again lengthen along the inside of the leg from the pubic bone to the foot. Your lower leg will come away from the horse and your inner thigh will lie along the saddle. Slowly soften your knee to let your leg rest in this position. You may find that your calves are no longer on the horse’s sides depending on how long your leg is and the shape of the horse’s barrel. This is OK. You now have the flat thigh against the horse for stability. 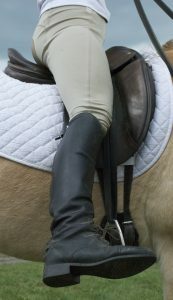 Use this Murdoch Minute to lengthen the inside of your leg for an even contact with the stirrup and solid inside leg. This will alleviate discomfort in your ankles and knees and allow your horse’s forward movement. And always remember to enjoy the ride!